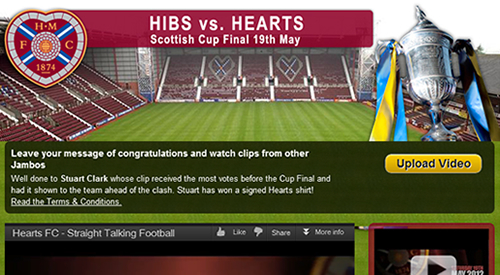 My first app at Wonga.com was the Hearts FC Football App, to promote Hearts FC getting to the final of the Scottish Cup Final against Hibernian FC (Hibs). The app was a simple competition app hosted on Wonga’s Facebook page, letting fans upload a video to cheer the team on in their final match of the season. The app uses YouTube integration to lets users upload videos into the application. 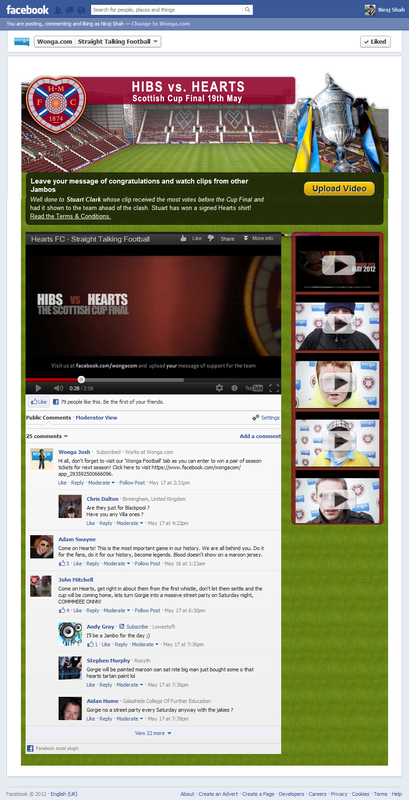 The fan favourite video (as voted by fans) would be shown to the team ahead of their match against Hibs. In addition to the video, the winner would also win a signed t-shirt from the club. The app was live for only a week before the final on May 19th 2012. The app received around 20 video uploads from various fans, but hundreds of votes. The application was developed in PHP and MySQL, and integrated with YouTube to bring videos and thumbnails back for uploaded videos. Social plugins like the Facebook Like button and Comments plugin were used to allow users to share and comment on the videos. There was a simple CMS in the back-end to view user stats, export the user’s details, and moderate the video uploads.